The only PATENTED web-based property tax collection portal designed to simplify escrow property tax processing and payments between tax offices and lenders, tax services, title companies, large private payers, and individual home owners. Tax Offices across the US send complex billing data files to mortgage escrow servicers several times per year. They then rely on the escrow servicers to return mass escrow payments accurately each and every tax cycle. For these reasons, Tax Offices experience refunds, duplicate payments, overpayments, errors year after year, tax cycle after tax cycle. That is where Autoagent™ comes to the rescue. Our software retrieves fresh tax billing files that reflect current balances, blocks duplicate payments from multiple payers, and delivers perfect payment files that can be imported directly into any tax software. There is no software to install, manage, or integrate. 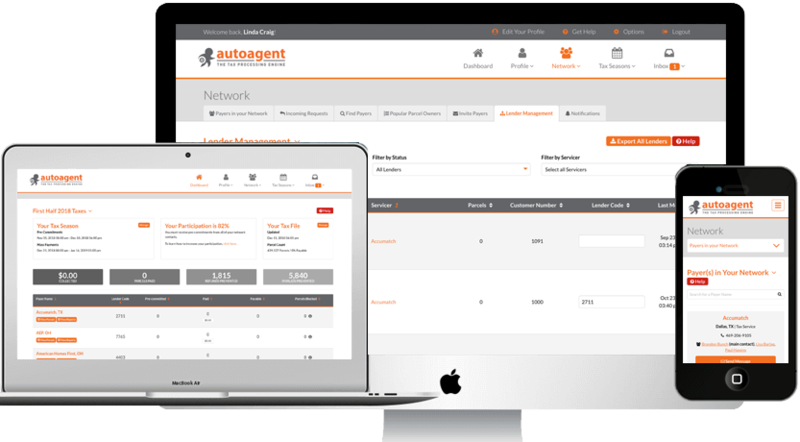 Autoagent™ is always available on every platform and device that has an Internet connection. We'd be happy to answer your initial questions or show you a 30 minute demo of what the power of Autoagent™ can do for your office.